Never know where you’ll stumble upon a good story you haven’t read. Though, I have read a fair amount of Ray Bradbury’s short stories, I’m far from having read them all. One of the many blogs I follow is Science-Based Medicine—a group of relatively-sane voices in an internet full of nutso. 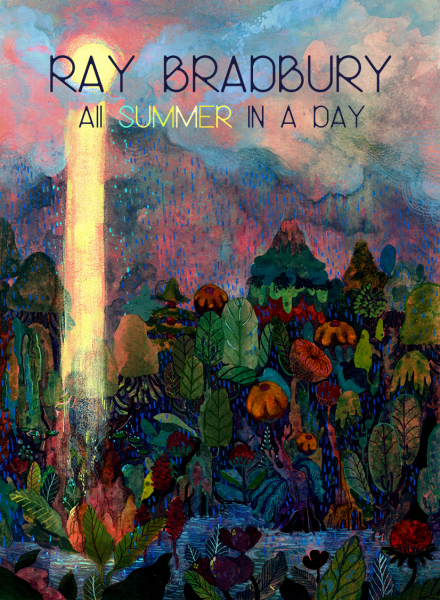 Though Bradbury stories have little to do with medicine or science, of the real-life variety anyway, a recent post of SBM included a link to a PDF of All Summer in a Day. One of Bradbury’s on my unread list. It gave me something to read while I waited for my eye exam. Unfortunately, short as the story is, I only got halfway through it before they called my name (of course the doctor is on time when I’m actually enjoying the wait). Then they put those dilating drops in my eyes. I tried to finish the story while waiting for the drops to kick in, but the world got fuzzy quickly and looking at my phone screen became like staring into the sun. Appropriate considering the subject of the story, but irritating. I had to wait until I got home to finish it. Anyway, good story. Glad I came across it in August. It might have been a bit too depressing a read in January.